Walking the busy streets of Georgetown in Penang, Malaysia is a trip for the senses. The smell of street food frying in woks mingles pleasantly with the aroma of burning joss in front of temples. Bollywood music blasts from speakers around little India; the mesmerizing call to prayer resounds off of colonial-era buildings. It is no wonder that Malaysians take so much pride in Georgetown, the earliest colonial settlement on the island of Penang. UNESCO took notice in 2008 and declared the entire city a World Heritage Site. (Read up on other UNESCO World Heritage Sites in Southeast Asia.) 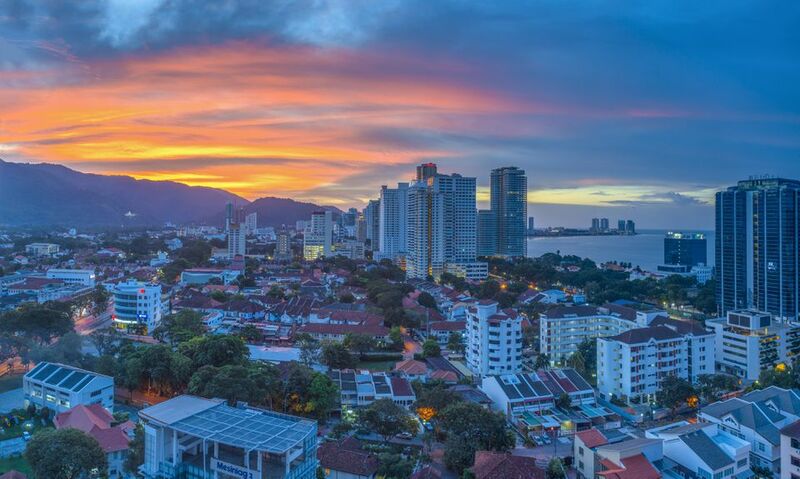 Penang is known as the "Pearl of the Orient" - Georgetown is its capital and soul; no visit to Malaysia is complete without taking in the sites, smells, and wonders of this tantalizing city. Ferries arrive at the Weld Quay jetty - which also serves as a major bus hub for Penang - on the eastern edge of the city. Most of the tourist action is centered in Chinatown around Jalan Chulia and Love Lane where budget accommodation, bars, and restaurants dominate the streets. Gurney Lane - on the coast about three miles northwest of the city center - is another popular tourist strip of hotels, street food, and chain restaurants. KOMTAR Centre in the southwest part of the city is a massive complex at the bottom of the tallest building in Penang. KOMTAR has numerous eating and shopping options; the complex also serves as a major bus terminal for getting around Penang. Considered by most to be the best food in Malaysia, the world-renowned food in Georgetown will have you wanting to move here for good. The resident Chinese and Indian populations take pride in serving up their best cheap eats; Malaysian noodle dishes and Malaysian Indian food are unlike any other. Street carts - particularly on Jalan Chulia and Gurney Lane - serve up local specialties for under $2. It is nearly impossible to walk a block to Georgetown and not come across an eatery or street cart; grazing from one cart to another is the best way to enjoy the food in Georgetown. For the best dim sum and Chinese noodles, head to Lebuh Cintra in Chinatown where carts steam late into the night. Food complexes such as the Red Garden on Jalan Penang serve up treats from every country in Southeast Asia under one roof. Read more about Penang food and where to eat in Georgetown. Aside from stuffing yourself to satiety, Georgetown has a few interesting sites to check out. Heritage Walks: The Penang Heritage Trust office on Church Street should be your first stop in Georgetown. The friendly office has free maps and brochures for exploring the hidden sites and history of Georgetown that you would probably miss otherwise. Visit their website: www.pht.org.my (offsite). Kek Lok Si: A contender for the title of the largest Buddhist temple in Southeast Asia, Kek Lok Si is situated on a hill overlooking Georgetown. A cable car takes you to the highest part of the temple where a 120-foot statue of Kuan Yin resides. Take bus #201, #203, or #204 from KOMTAR to Air Itam - the temple is a 10-minute walk from the bus stop. Read more about visiting Kek Lok Si Temple. Fort Cornwallis: Located on the eastern coast of Georgetown, Fort Cornwallis was constructed by Sir Francis Light after taking possession of Penang in 1786. The fort, along with a lighthouse, stand on a pleasant, seaside esplanade. Read more about Fort Cornwallis. Read about other things to do in Penang. Outside of KOMTAR Centre, most of the shopping in central Georgetown is found in small boutiques and shops along Jalan Penang and in Little India. Serious shoppers should head just outside of the city to Queensbay Mall and the nearby Bukit Jambul Complex - both will test any shopper's stamina! Buses #304 and #401E service both shopping districts. Read more about shopping in Penang. The northern end of Jalan Penang has developed into a pedestrian-only eating and drinking district. Tapas bars, posh nightclubs, and cosmopolitan lounges spill out onto the pavement. Drink prices reflect what you would expect to find in the West. The Slippery Seniorita has been an icon of Penang nightlife since 2001; the skillful bartenders put on quite a show some nights! A smattering of reggae bars and backpacker's hostels along Jalan Chulia have sidewalk tables for socializing. Jalan Gurney attracts people looking for late-night food as well as a social scene. A number of hotels stand close to the history, culture, and shopping destinations within Georgetown. Budget picks along Love Lane and Jalan Chulia cater to Penang's backpackers; higher-end establishments like the Eastern & Oriental take care of the higher end of the scale. Taxis, trishaws, and a new bus system make getting around Georgetown and Penang easy. Most buses leave from the Weld Quay jetty or the KOMTAR complex; nearly all can be hailed in Chinatown. A free bus circulates around the city every 20 minutes. Read about transportation options and getting around Penang. Georgetown occupies most of the northeastern part of Penang Island - known locally as Pulau Pinang. By Land: The mainland town of Butterworth is the gateway to Penang. A bridge connects Penang Island with Peninsular Malaysia, however most people take the 20-minute ferry which conveniently departs from adjacent the bus station in Butterworth. By Air: Situated in Bayan Lepas around 12 miles south of Georgetown, the Penang International Airport (PEN) is serviced by Air Asia, Malaysia Airlines, and China Airlines just to name a few. A fixed-rate taxi to Georgetown takes around 45 minutes or you can save money by taking bus #101 for $1.